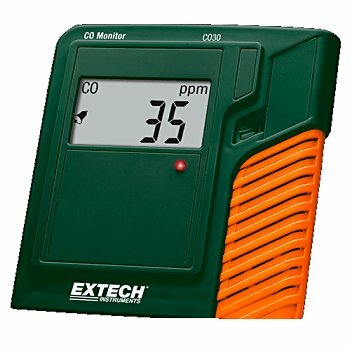 Extech's CO30 Carbon Monoxide Monitor is a multi function meter that measures and displays Carbon Monoxide (CO) concentration, Air Temperature, and Relative Humidity. The Extech CO30 monitor features a programmable audible alarm with a high decibel tone that sounds when carbon monoxide concentration rises to unsafe levels. The Extech CO30 Carbon Monoxide Monitor also features a visible bright tri-colored LED that changes colors as different concentrations of gas are detected. Unit can be wall mounted or used on a desktop close to areas of concern.